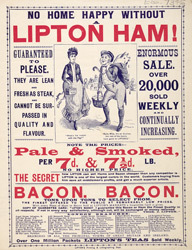 This leaflet is advertising Lipton ham and bacon. For the wealthy living in the Victorian period meat was an everyday item on the menu. Meat like venison or pheasant was eaten with vegetables and lots of very rich sauce and meat was often eaten twice a day. However not everyone could afford meat, many of the working classes could only afford to buy cheap meant like bacon or off-cuts from local butchers stores. Meat was often only eaten once or twice a week and then it was given to the male members of the family as it was felt that they worked longer and more physically exhausting hours at work.